SOME 121,470 STUDENTS across the country are waking up to start their state exams this morning. 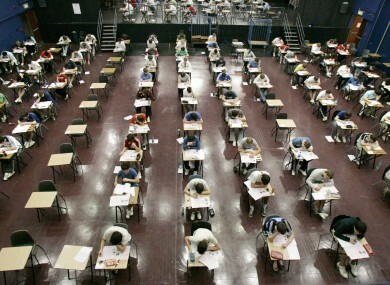 The Junior Cert and Leaving Cert exams are taking place in over 5,000 exam centres nationwide. Psychologist David Carey has over 25 years’ experience in both clinical and educational settings. He told TheJournal.ie that breathing and using your imagination to think of positive times can help overcome stress. “The obvious advice is to get a proper night’s sleep and eat breakfast – that’s really important. Also, get some fresh air. If you’re going over study notes, do it outside in the back garden or on the school grounds and away from people. Carey added that students can use deep breathing before their exams, and even during exams, to help them instantly relax and focus. “Breathe down into the belly, count to six or seven during the inhalation – try to pause – and then count to five or six on the exhalation. Breathe through your nose, lips together and teeth apart. Breathe down into the belly for maybe two or three minutes if you can. Also, in the mind’s eye imagine a happy time in your life or someone or something you care about – a positive emotional shift is very very important. He added that exam stress is normal and there’s nothing wrong with you if you’re anxious about sitting your exams. Carey recommends eating a simple breakfast and cutting back on acidic foods or drinks. He said to try and eat just plain toast and drink green tea if your stomach is upset. This advice is echoed by the director of the National Association of Principals and Deputy Principals (NAPD) Clive Byrne, “It’s important that students keep things in perspective during this stressful period. The Leaving Cert is just one set of exams and although important, is a stepping stone to what you want in life. Being in the best possible mental and physical condition is key. Remain calm and focused: you’ve done all you can. Don’t stay up all night cramming. After five or six years of secondary education, a late night of study will not make much difference to your knowledge of a subject. An early night will leave you refreshed and better prepared mentally for the following morning. You need to be relaxed on the day of the exam in order to feel in control of the situation—and that’s difficult to achieve if you rush into the exam hall as it starts. You will need about 15 minutes ‘quiet time’ to mentally go over your ‘game plan’ one last time. Have the obvious tools ready for your exams, such as pencils, rulers and pens. Make sure you have subject-specific tools at the ready, like a calculator for maths or coloured drawing pencils for history of art. Don’t participate in the exam post-mortem—you may well only serve to dishearten yourself. You can’t change what has just happened in the exam hall and your focus must be on the present and next task at hand. If there is no attempt made to answer a question, the examiner can’t give you any marks. Work on the basis that you will get an answer written for the required number of questions. If you find you’re running out of time, or are not satisfied with a question, move on to answer the next and return to polish it if you have time at the end. On the days of your exams, remind yourself of all that you have achieved. Positive self-belief will help you with your confidence when you sit your exams. It’s almost over, and your reward is a summer break that is exam free. Psychologist David Carey added, “It’s important to remember that this is not the defining moment in your life – in two or three years no one will ever ask or care what your leaving results are. There are far more important things to come in your life. Email “Exam time: Here's how your breathing and imagination can help during your exams”. Feedback on “Exam time: Here's how your breathing and imagination can help during your exams”.